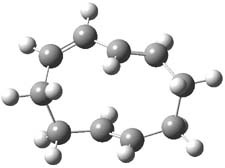 Alder and co-workers have published a substantial theoretical study of potential [6+4]-cycloaddition reactions.1 There is much too much to summarize from this study, but I highlight here an interesting result that is consistent with one of the themes of the book and blog: unusual potential energy surfaces. 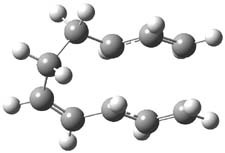 They examined two [6+4]-cycloadditon routes involving 1,3,5-hexatriene with 1,3-butadiene to give 1 and 2. These products are shown in Figure 1. A competing [4+2]-cycloaddition is also possible, giving rise to 3 and 4. Interestingly, only one TS is found leading to 1/3 and one TS leading to 2/4. (These TSs are also shown in Figure 1.) This is reminiscent of many examples from the book and blog where a single TS seems to lead to 2 different products. A valley-ridge inflection point divides the surface between 1 and 3 (VRI-1), and a second valley-ridge inflection point separates 2 from 4 (VRI-2). In addition a Cope transition state (CTS1) takes 1 into 3, and a second TS (CTS2) takes 2 into 4. This type of surface requires study of the dynamics to truly predict what the outcome will be of the reaction. Unfortunately, the low barriers for the Cope rearrangements along with 3 and 4 being much more stable than 1 and 2 indicates that the [6+4] product is unlikely to be observed. Nonetheless, this is yet another example of an unexpected PES. An interesting challenge would be to subvert this reaction into a π6a + π4a mode, i.e. with two antarafacial rather than two suprafacial components. This mode does not seem to have been explored in the article Steve cites. I suspect though that it might be a challenge to produce substituents that block all the more simple routes in a steric sense, leaving only this mode. It would nevertheless be of interest as an example of what might be called a double-twist Möbius system. 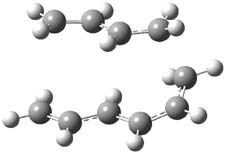 Although examples of such topologies are well known for hexa and octa-phyrins, they are as yet unknown for transition states. The transition state for this one can be inspected here, where it has formed a component of my taught course on pericyclic reactions for a few years now.